rear knuckle upper spherical discussion - Page 3 - Miata Turbo Forum - Boost cars, acquire cats. I'll take my aeroplanes assembled with certified fasteners thank you very much! Unless you're buying a part with a cert from china or india, forging a cert aint no thang there. That is incorrect. You can get quality products from China and India. You just have to find a place with tight quality control. Generally that means you have to have someone on the ground there though to keep tabs on them. i made a sleeve today, but forgot to snap a pic. using MSP CAD, i made a drawing for those wanting to reproduce my efforts. That was kind of my point, you can get good stuff from china and india but you can also get parts that a crap with good paperwork. That might not be a press fit. When I measured all my bushing holes before I sized my control arms they were all more or less 1.56 depending on how much the control arms had ovaled. I didnt measure the knuckle but I know the bushings are the same diameter, but its totally possible the control arms are larger or I've managed to stretch the **** out of mine. But before you cut the stock please double check the bore and make sure you're not catching a lip or something. i measured at atleast 8 spots with a snap gauge. all within 0.002" of 1.496". but yes others should check theirs first an adjust accordingly. May I ask, why a taper on one side? 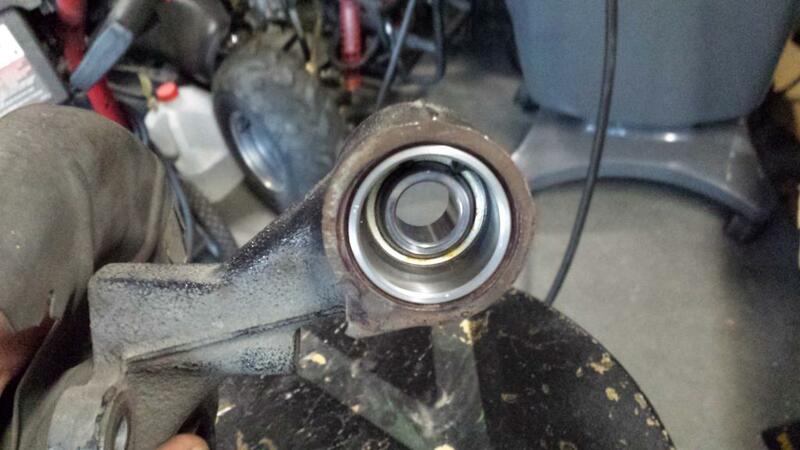 Will you not just press the bearing into the open end and use a snap ring to secure it? Is the taper necessary? its just for aesthetics, it could just be a simple shoulder too as long as its cut back enough to clear the bolt and spacer under articulation. Last edited by hi_im_sean; 12-07-2014 at 04:17 PM. That was what I was interested in. I wanted to see if you did it for the articulation. I am excited to see how this works for you, but I am also interested in your metric of improvement. Will you just be going by a "seat-of-the-pants" gauge or do you have data points that you will be comparing? i made a pair of sleeves the other week, but i had a snap ring snafu and encountered dimensional inaccuracies from aurora. 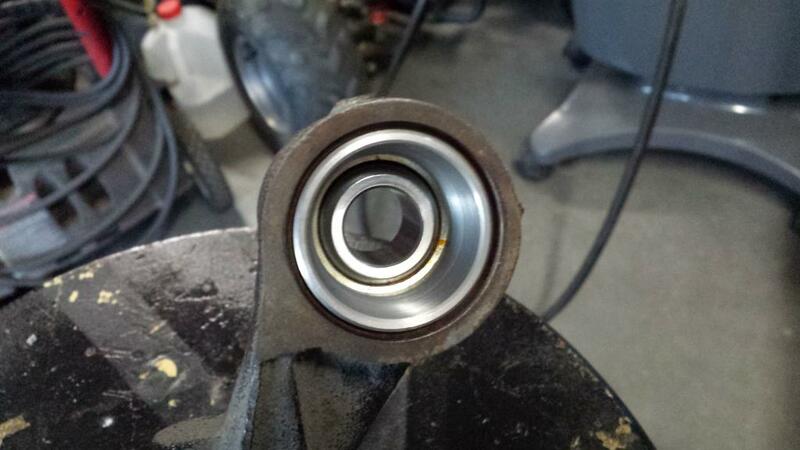 this cause a gap of about 0.012" between the bearing and snap ring. i was also using a small boring bar and things were chattering a little, wasnt happy with ID surface finishes. neither likely would have caused any issues, but im ----. the bearing race width measures 0.560", aurora indicates 0.562". if you use the drawing above take note of that change. made another pair recently that are picture worthy. i ended up going to 1.495" on the OD, as i didnt want a press fit into the knuckle. i find these spherical bearings to be sensitive to bore diameters, and 2 compounding press fits would have just been too difficult to control with any accuracy. especially when aurora install specs give a bore range of 0.0006". i made the ID 1.311", and its a nice tight fit. this shows the one concern i had about the snap ring ears not clearing the ball. the drawing indicates a snap ring groove depth of 0.042 +/- 0.002. i went to 0.048" to help with clearance. there is 0.016" clearance between the ears and the ball as measured with a feeler gauge. i love good rigid tooling. this was after a 0.050" depth of cut with a roughing insert, but finishing feed rates. at 1.495" its a perfect slip fit, went in by hand after sanding the bore clean. this will be part of my suspension package as a whole. i dont think this one mod will make any appreciable difference in performance or feel compared to a bushing in good shape (maybe lewis hamilton would notice, im a mere mortal). currently i can grab my rear wheels at 6 and 12 o'clock while the car is jacked up and change the camber a degree or so with hand pressure; i pushed my bushings out with my thumbs. a new stock replacement bushing would have fixed that too, but i dont like the idea of a bushing cut to a taper (or crowned) to deal with articulation. this seemed like a more proper fix to me, and because race car. Last edited by hi_im_sean; 12-22-2014 at 10:25 PM. Very awesome piece. I look forward to your other components. I have a dedicated autocross car that I just put a full poly bushing kit into and am very unpleased with the binding. Even with zerk fittings and a very liberal amount of grease it is very difficult (almost impossible) to move the upper/lower control arms by hand when torqued. How much to make a set? I would probably just weld the sleeve into the upright. im so glad i took bobs advice regarding poly, thats exactly what i didnt want to find out the hard way. im not sure ill have time to make another nice set, but ill see what i can do. do you want my "prototypes"? these do take quite some time on the lathe, so probably at least $80 for a pair, shipped. that includes the "good advice" discount. 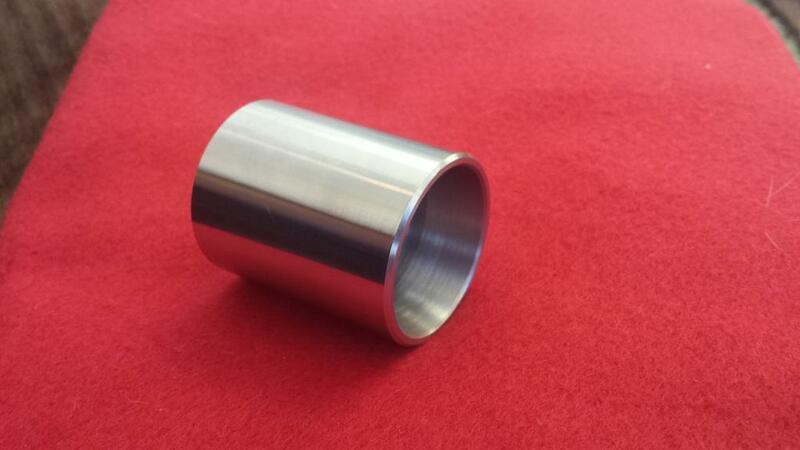 Do you do the inner spacer sleeve as well? I have been looking at just getting the ISC ones but I think yours look better engineered. years ago I built some custom top hats for Koni shocks and used a very similar setup to convert NB top hats to sperical ball tops instead of rubber bushings. They worked very well till I upgraded to XIDA doubles amd sold them. yes, i will be making my spacers this weekend or next week when i go to install the bearings. so if you want those too, let me know before i start so i can make 2 sets at once. adding those will be more $ of course. i plan on making them as simple as possible so tapers and such shouldn't be needed. The ISC ones were $100 for the set both sides including bearings. 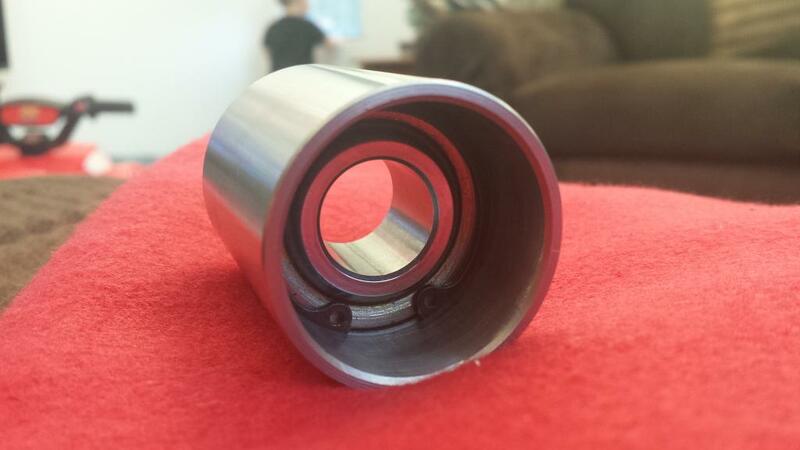 I suspect ISC uses cheap bearings however and the way they did theirs is more cheaply done no snap ring groove etc. ISC uses 4 simple rings, that dont need to be held to a precise tolerance. i could make those in 15 minutes and they would be $20 at most. if i was selling them as a retailer in large quantities, i would buy some 1.5" pipe, turn the OD with 1 pass, and knock them out for less than a dollar(at my cost). my doohickeys requires 2 precision cuts, many features, and takes me about 3 hours to do a pair. send my drawing to a local machine shop(actually dont, theyd laugh at it), it will be much more than $80 for a small qty. i talked to my friend whos an estimator and cad guy(he laughed at my drawing) for an aerospace machine shop. if i could get enough interest/group buy to justify writing a cnc program, the cost could come down considerably. im told ill probably need at least 15 people. ISC is fairly permanent and difficult to R&R, the snapring way isnt, but is much more expensive if you dont have your own lathe. pros and cons, you get what you pay for. im sure ISC uses a 38mm bearing, which i suspect is a snug fit into the spindle but not quite interference. i cant comment on manufacturer or country of manufacture, but they are the steel on steel variety which is cheaper. you can see the grease groove in the pic on their site. the 2 PTFE lined aurora brand bearings i got were $84 to my door. you can get a steel on steel qa1 for like $11. Your drawing's not that bad, I've seen worse. 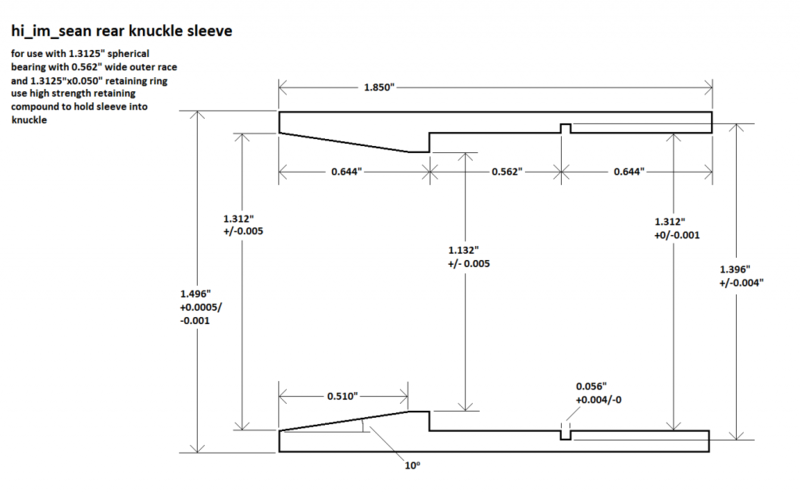 Theres no dimensional or geometric tolerances or surface finish callouts and the dimensioning itself is sloppy as **** but at least its got all the dimensions you'd need to make it and the machinist wont have to do math. I made my own end links with aluminum rod ends and aluminum hex bar stock. also re made the rear swaybar chassis mounts using 5/8" aluminum rod ends and re-made the brackets out of 1/4" aluminum dropping about a pond of weight.